Milliner’s Cottage is on Castle Hill on the original site of the city of Cambridge and now a mile or so north of the present-day centre of the city. There is a castle, but it is just a grassy mound next to the car park of the Council offices at Shire Hall, a hundred yards further up the hill. 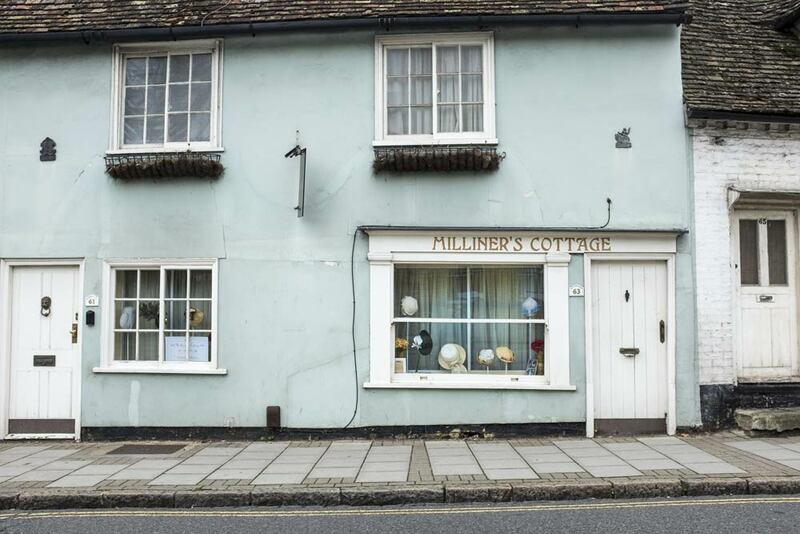 I googled ‘Milliner’s Cottage’ and according to the estate agent’s details from 2013 that I googled, (is everything kept forever, online?) Milliner’s Cottage is a Grade II listed Georgian property created out of two cottages, one of which was indeed a milliners’ cottage. So it is a cottage, a home. It is not a business. And that being so, I think it is odd that there are hats in the window. I think it odd, too. What does the sign in the left-hand window say? Oh, and ‘oh’ again. You are right. The sign says ‘Milliner’s Cottage’ and on the second line it says ‘Hats Of Distinction’. I hang my head in shame for poor research. Yes but that’s still interesting – you mean it actually is a functioning business after all? I was thrown off because I thought it was the cottage next door, number 61. Had I looked a bit more closely (aka in a less blinkered way) I would have seen the very obvious hats in the window. So yes, probably it is a functioning business. Next time I am up the hill I will perhaps knock on the door of 61 (or 63). Well, let us know if you do. And if you are tempted by a hat of distinction! Something in the upside-down flowerpot style. Perhaps a bow. Looking forward to it. Can’t wait. !